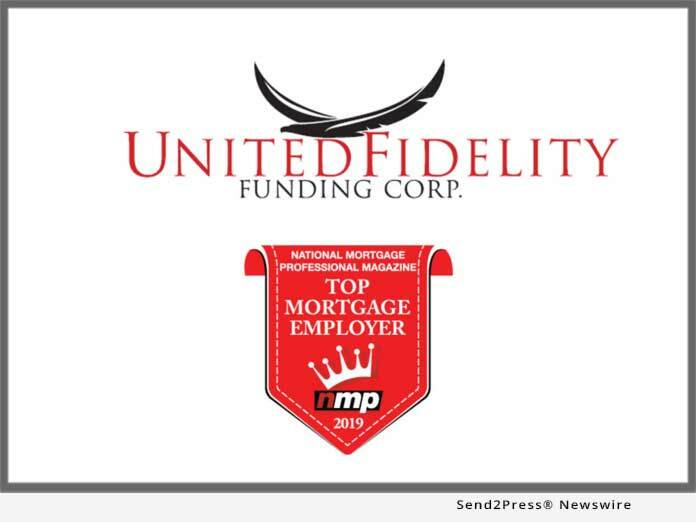 KANSAS CITY, Mo., Feb 22, 2019 (SEND2PRESS NEWSWIRE) -- United Fidelity Funding Corp. (UFF), a rapidly growing national mortgage banker, announced that it was designated a Top Mortgage Employer for 2019 by National Mortgage Professional (NMP) magazine. NMP arrives at the annual winners by polling its readers about their employers based on the following criteria: corporate culture; compensation; day-to-day management; internal communications; marketing; training; resources; long-term strategy; ingenuity; speed; technology; reputation; and industry participation. The magazine is one of the mortgage industry's leading go-to sources for extensive news coverage for mortgage lending, compliance, secondary marketing, servicing, settlement, technology and more. UFF runs a highly responsive, nimble, boutique-style operation that avoids the problems many larger lenders have in providing the type of hands-on service, visibility, speedy turn times and robust technology tools that UFF delivers. The company provides partners with individualized support from the point of application all the way through funding by having a dedicated team of employees ready to assist at every key step of the lending process, ensuring very smooth and easy transactions. "We're truly honored to be recognized by NMP magazine as a Top Mortgage Employer on an industry-wide level," said John Bell, principal at UFF's West Coast operations. "The industry is experiencing a lot of volatility and contraction right now, and originators have concerns over the stability and long-term survival of many lenders. At UFF, we're actually in an expansion mode and are lucky to have developed a close-knit culture compromised of dedicated employees, which is a testament to the company earning NMP's 2019 Top Mortgage Employer distinction." Kevin Marconi, COO of UFF corporate, commented, "Over the years, UFF has earned a reputation for being both a high-tech and high-touch lender that gets customers the answers and information they need to expeditiously complete transactions. We have a low attrition rate at UFF, which is the result of the unwavering commitment our greatest asset has - the employees, and winning NMP's Top Mortgage Employers award in part reflects this. Our entire team is elated to receive this prestigious accolade." Of note is that UFF has won multiple awards for being an industry-leading Top Tech-savvy Lender. The company offers an extensive set of loan programs and competitive pricing to fit the needs of many types of borrower profiles. The company provides its originators and employees with the latest web-based loan management and decisioning tools to offer its partner network full visibility into the status of loans at any given time in an effort to deliver responsive service. UFF established a paperless lending process, from submission to funding, facilitating good, easy communication and accurate information for smooth, quick closings. For more information, visit: http://uffwholesale.com/ or https://uffwest.com/.